The TVR-1180C Mk1 Stack Tri-Coupler is an adapter that allows for a single rocket to branch into 3 separate stacks. All nodes on the TVR-1180C are 1.25 meters (small). As with all adapters, liquid fuel will flow through it. 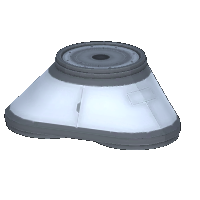 Despite the similar name, the TVR-1180C is not a decoupler; it does not jettison anything nor does it add a stage to the rocket. It branches into 3 separate stacks, but they are unsupported and prone to bending or breaking if the weight and thrust are not properly distributed. Rockets incorporating a tri-coupler are also likely to wobble, unless the stacks are opportunely bound together with EAS-4 Strut Connectors. 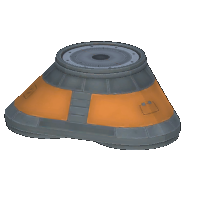 The tricoupler is also subtly asymmetrical, so rockets must have control options to correct for induced pitch, yaw, and/or roll. The tricoupler has non-standard (0.3 instead of 0.2) drag, meaning it should be placed behind the center of mass. 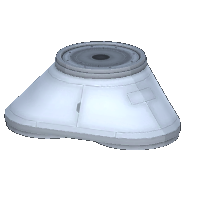 Another, unconventional use of this part is as a landing 'foot' - when landing very large craft (such as bases), the stock landing legs aren't big or powerful - using the strut parts as 'legs' and the tricoupler as a 'foot', you can artificially make your own landing leg! As of version 1.6 this adapter has three textures that can be switched in the editor. This page was last edited on 27 December 2018, at 14:37.